“Market conditions are changing. The continued rise in interest rates suggests we are in the early stages of a bond bear market, which could intensify as central banks withdraw liquidity. The receding tide of liquidity will start to reveal more rocks beyond what has been exposed in emerging markets so far, and the value of a value discipline will be in avoiding the biggest capital-destroying rocks. If a rock emerges on the crowded shore of U.S. momentum, it could result in a major liquidity challenge, as momentum is often most intense on the downside as a crowded trade reverses. So investors are facing a large potential trade-off right now: continue to bet on the current dominance of momentum and the S&P 500, or bet on change and take an active value bet in names with attractive value and optionality, but with negative momentum,” said Clearbridge Investments in its market commentary. We aren’t sure whether long-term interest rates will top 5% and value stocks outperform growth, but we follow hedge fund investor letters to understand where the markets and stocks might be going. This article will lay out and discuss the hedge fund and institutional investor sentiment towards Microsoft Corporation (NASDAQ:MSFT). Are hedge funds crazy about Microsoft Corporation (NASDAQ:MSFT) right now? Absolutely yes. Earlier this year ValuaAct Capital which invested $2 billion when Microsoft was trading at lower $30s, completely sold out of Microsoft. This didn’t seem to discourage other hedge funds. The number of long hedge fund positions inched up by 9 in recent months and Microsoft is now the most popular stock among 694 hedge funds that disclosed their Q3 holdings by Thursday night (check out the list of 30 most popular stocks among hedge funds now). In this article we will also compare Microsoft’s popularity against stocks like Alphabet Inc (NASDAQ:GOOGL), Alphabet Inc (NASDAQ:GOOG), Berkshire Hathaway Inc. (NYSE:BRK-B), and Facebook Inc (NASDAQ:FB). To most market participants, hedge funds are seen as slow, old financial vehicles of the past. While there are over 8000 funds in operation at present, Our experts look at the elite of this group, about 700 funds. Most estimates calculate that this group of people control most of the smart money’s total capital, and by monitoring their inimitable equity investments, Insider Monkey has uncovered a number of investment strategies that have historically beaten the market. We were able to generate large returns even by identifying short candidates. Our portfolio of short stocks lost 26.1% since February 2017 even though the market was up nearly 19% during the same period. We just shared a list of 11 short targets in our latest quarterly update. We’re now going to review the key hedge fund action encompassing Microsoft Corporation (NASDAQ:MSFT). How are hedge funds trading Microsoft Corporation (NASDAQ:MSFT)? Heading into the fourth quarter of 2018, a total of 170 of the hedge funds tracked by Insider Monkey were long this stock, a change of 6% from one quarter earlier. 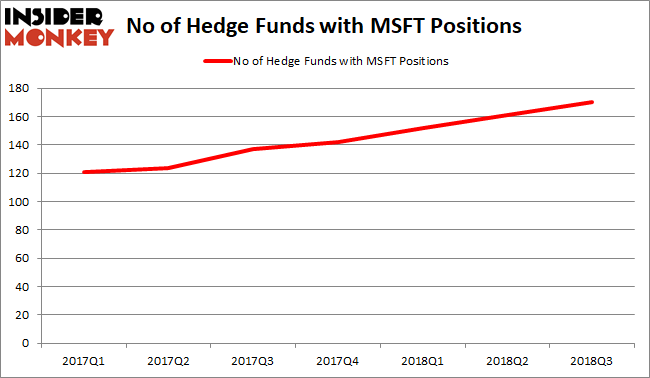 On the other hand, there were a total of 137 hedge funds with a bullish position in MSFT exactly a year ago (you can see the steady increase in number of hedge funds that are bullish on Microsoft). With hedgies’ positions undergoing their usual ebb and flow, there exists an “upper tier” of noteworthy hedge fund managers who were increasing their holdings meaningfully (or already accumulated large positions). 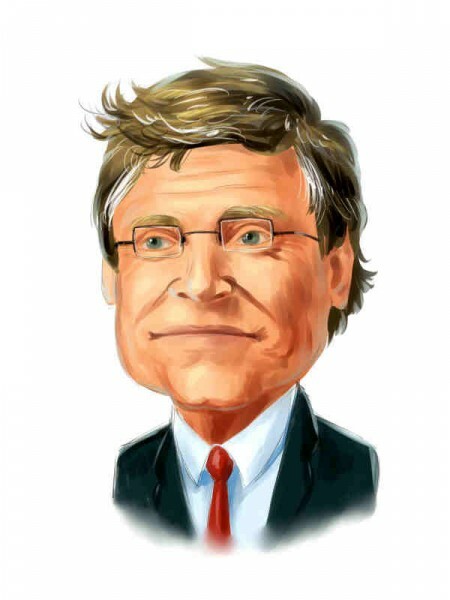 The largest stake in Microsoft Corporation (NASDAQ:MSFT) was held by Bill & Melinda Gates Foundation Trust, which reported holding $2744.9 million worth of stock at the end of September. It was followed by Eagle Capital Management with a $2493 million position. Other investors bullish on the company included Fisher Asset Management, AQR Capital Management, and Lone Pine Capital. As aggregate interest increased, some big names were breaking ground themselves. Suvretta Capital Management, managed by Aaron Cowen, established the largest position in Microsoft Corporation (NASDAQ:MSFT). Suvretta Capital Management had $459.4 million invested in the company at the end of the quarter. Gabriel Plotkin’s Melvin Capital Management also made a $47.4 million investment in the stock during the quarter. The other funds with brand new MSFT positions are Ian Simm’s Impax Asset Management, Robert Pohly’s Samlyn Capital, and Clint Murray’s Lodge Hill Capital. Let’s go over hedge fund activity in other stocks – not necessarily in the same industry as Microsoft Corporation (NASDAQ:MSFT) but similarly valued. These stocks are Alphabet Inc (NASDAQ:GOOGL), Alphabet Inc (NASDAQ:GOOG), Berkshire Hathaway Inc. (NYSE:BRK-B), and Facebook Inc (NASDAQ:FB). This group of stocks’ market valuations match MSFT’s market valuation. As you can see these stocks had an average of 128.75 hedge funds with bullish positions and the average amount invested in these stocks was $17174 million. That figure was $31956 million in MSFT’s case. Facebook Inc (NASDAQ:FB) is the most popular stock in this table. On the other hand Berkshire Hathaway Inc. (NYSE:BRK-B) is the least popular one with only 84 bullish hedge fund positions. Seven years ago David Einhorn tried to go soft activist on Microsoft when the stock was trading for less than a quarter of its current price. This was followed by Curtis Macnguyen and Whitney Tilson’s articles/comments. ValueAct Capital is the first hedge fund that successfully instigated change at the tech giant and also benefited the most among the hedge funds we track. Billionaire Mandel’s Lone Pine also recommended a position in the stock a few years ago at the Sohn Conference. The last time we heard from a hedge fund manager regarding high flying tech stocks was this week’s Sohn San Francisco Conference. Longtail Alpha’s Vineer Bhansali recommended shorting technology shares. He thinks tech stocks will underperform in a rising interest rate environment. You can check out the entire list of hedge fund recommendations at this conference on our site. Overall, we think, Microsoft reinvented itself and it is a good long-term bet.